The demand for commissioned art work has skyrocketed since the website was established early in 2017. With commissions ranging from works in ink to more vibrant acrylic abstracts on small and large scale canvases, here is a taste of some of the artworks created for clients around the world to date! Want a One of a kind Papa G Artwork? Like what you see here or elsewhere on the website or would like something completely different then contact Alastair to get in touch with your dream artwork requests! Commission for a couple who reminisce about fond memories of times spent in Havana Cuba. 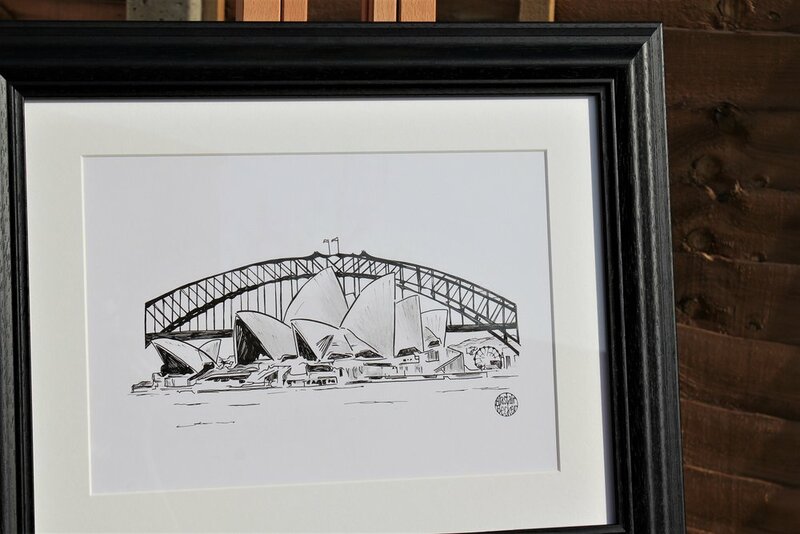 Sydney - 1 of 4 commissioned artworks for a couple to remember their travels around the world. New York - 2 of 4 commissioned artworks for a couple to remember their travels around the world. Table Mountain - 3 of 4 commissioned artworks for a couple to remember their travels around the world. A commission for a lovely couple who wanted a series of artworks to remind them of their amazing travels around the world from Cape Town to the Safari adventures with giraffes. A double image commission for a client’s mother to celebrate her special birthday - the perfect gift for a loved one! Acrylic for client who saw the new 'View From Above' Collection (coming January 2018) and asked for her own unique artwork similar to those in the collection. Artwork commissioned for a friend's husband as a surprise christmas present - Happy Christmas 2017! Commissioned piece drawing inspiration from the simplicity of some of Picasso's great illustrations of animals - lots of fun to create and a fun artwork to brighten anyone's mood all year round! A one-off artwork for a client who came across Papa G’s artwork at ‘The Coffee Box’ in Boxford - a real hidden gem of a place - in Suffolk where some Papa G artworks are on show all year round.